The auction for .eth addresses has started, and bids are rolling in. Back when .com was the only top-level domain (TLD) that really mattered, choice domain names would change hands for millions of dollars. But in recent years the number of TLD's has greatly expanded, and tech startups often choose to snap up a .co, .io, or even .digital cheaply instead of forking out for one of the more well established extensions. Generic TLDs are interchangeable in terms of function, but when an extension corresponds to a specific use case, scarcity increases and price goes up—which is exactly what has happened with the new Ethereum Name Service, which went live on May 4, and which allows users to register .eth domains compatible with the Ethereum network. Ethereum, although less well known than Bitcoin, is a blockchain-based computing platform which includes a cryptocurrency, called Ether. But unlike Bitcoin it also includes the capability to run "smart contracts," code functions that are stored in the blockchain and can trigger actions like transferring currency when certain conditions are met. The .eth domain extension is unique in that it can be pointed to an Ethereum wallet address or a smart contract, meaning that an amount of Ether could be sent directly to, say, Motherboard.eth instead of a standard address (which has the less memorable format 0xffF067E7ebe44Cc949C1c49Ca069BCFb4022b5fc). The new domains can be registered through an auction process run by Codetract.io, and the chance to register a personalized and/or prestigious address has captured the interest of the Ethereum community, which has currently bid a total of over 105,000ETH on domains ($9.4 million at current rates), with only 12 percent of the domains featuring in this auction round having been opened to bidding. 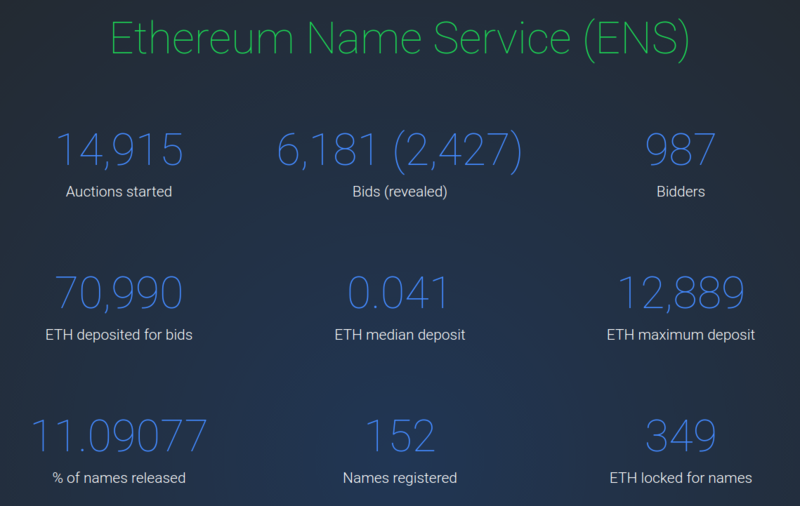 On an ongoing basis, progress of the registration process can be tracked via the ENS Twitter bot, which posts a steady stream of updates on the latest auctions and winning bids. Sharp-eyed bidders might spot that with less than a day left to bid, donaldtrump.eth is priced at a mere $2880—though the president, who has a penchant for owning Trump domains, has yet to confirm whether he is behind this particular deal. Previous PostBlockbounties: New Creative Way to Solve the Scaling Dilemma?